Mitch was our driver, he was super funny, educated, and over all awesome! We had to figure out a way to the pickup spot which kinda was a bummer since we were only 15mins (walking) away, but to someone that cant walk far it was rough. The experience was so amazing though, definitely recommended for anyone of age, I took my 10year old boy and mother. Deroy was our bus driver and he was very good. We were picked up at Treasure Island promptly at 7:30. We saw the Hoover Dam and made it to the Canyon by 11:00. Highly recommend this trip! Roy and Jim were very friendly and knowledgeable. We had to wait on a couple to come back for 30 mins past the departure time, but they handled it professionally and tried to accommodate another rider who needed to be at the airport as best they could. Would highly recommend, just make sure it’s the only reservation you have for that day, so that if any unforeseen things come up you won’t miss your next event! We had a great time and will never forget this experience! Our trip was fantastic right from the time we sat in the bus at Las Vegas. Roy who drove the coach was extremely friendly and made us feel very comfortable throughout the journey. Stephanie our guide was also amazing and very patient in explaining the different instructions and also answering the many questions that we had. Thanks Roy and Stephanie. The lunch was also very good and overall the trip was a memorable experience. it was a great trip, wonderful van (smooth and not bumpy) and we stopped for photos at the Hoover Dam as well. the canyon is beyond impressive. the skywalk was not as scary as I thought it would be (I don't' like heights, but this was easy). Note you can't take your camera or camera phone on the skywalk, they take and sell professional photos only. The instructions were clear, even though one family did not understand the time difference and came back tot eh bus 45 min late. all and all worth it and economical! Very nice experience Andy our driver Mike and tour giluide Marco were fantastic! If I make it out again I would do the tour again. Got downgraded from a large tour bus to a short 14 person bus, was cramped and not very wide aisles for a bigger person. Lunch was HORRIBLE. Dont order the veggie wrap, but all that was offered for a vegetarian. Should have given a voucher to pay for lunch at station 3 at the Canyon.Mitch was a nice driver and informative. Grand Canyon was breath taking. The overlook was extra and you cant take your camera on it. Viator has always delivered on all our tours I’ve taken. 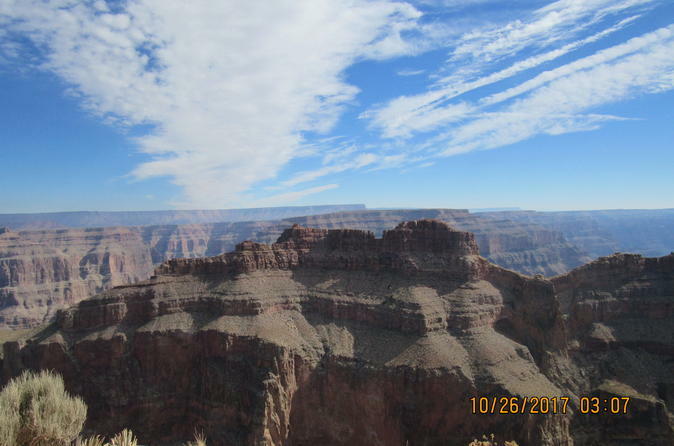 We loved this trip to the Grand Canyon .our pick up was easy,the bus was clean and comfortable, and the lenght of the trip was great. Also our lunch was great. The sandwiches were so fresh and the meat was delicious. The thing that made it so much nicer was our driver, Mike. He went out of his way for us to make sure we saw everything we could aling the way, stopping at extra stops but still kept our timing great, thanks Mike for the best day ever! Our bus driver Michael and assistant Brenda were very pleasant and professional. Michael gave us a very good overview of the many areas and scenes, he even offered to take pictures for the passengers.We were offered water and a light lunch, I had turkey sandwich and my husband had vegetable , which were both good. 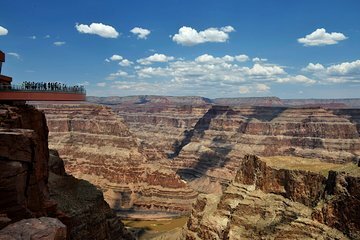 The view of the grand Canyon is amazing.... BUT.... the sky walk...is breath taking (WE paid for that as a part of the package and was a great deal, much more affordable than many other tours we found). . At first everyone was afraid to step on the glass over the Canyon, well.....of course..you are about 2000 ft in the air... and that's about how far you feel like you are going to fall. Anyway, all in all, it was a beautiful trip, great experience and great tour guides and professional service. By the way, the driver was on time and tried not to leave anyone behind. Kudos...Micheal and Brenda. Joan and Nalton : Florida.